throughout the trading session. The trade management is what determines if we choose to take quick scalping profits or if we would like to stay in a trade for a longer term. The trade management is crucial as this determines our stops and our profit goals, as well as if we decide to enter a trade with multiple contracts and scale out if the trade is successful. Below is the article I wrote for TradersWorld Magazine, issue #62, reagrding our EMINISCALP STALKER Auto Trade. I will be adding more to this page so please return often. Email me if you have any questions. Below is the article written for TRADERSWORLD Magazine. Clearly not a very pleasant way to spend your day. I did enjoy one Stalker though, the show that was taken off the air after a few seasons and replaced by some reality show. It was certainly entertaining. Guess all this reality tv is what pays the bills. But, there may be one Stalker that in reality,can possibly pay the bills. 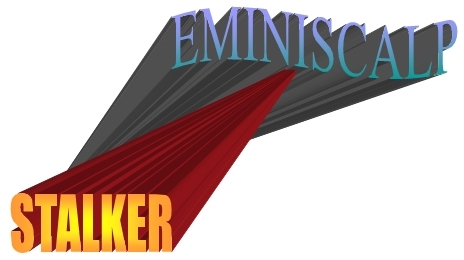 This is the EminiScalp STALKER, our new autotrade method, designed for NinjaTrader. Previous articles that I have written for TradersWorld Magazine focused on a few of my methods, including the EminiScalp ABL Autotrade. As mentioned in the articles, the ABL was created to look for entries at the current extremes of the market. I also mentioned that there were very good trades to be had between these extremes, but if a trader did not have the skills or was not proficient in determining critical trade areas, it would be best to not guess. If there was a specific reason to take an entry within the confines of the extreme areas, then by all means, take the trade. I believe that this is where many traders lose their money as well as their confidence. Anyone who has had the opportunity to read my book, my various articles or my comments on our EminiScalp website, they would unquestionably conclude that my thoughts in regard to trading certainly do not conform to industry norms. I am not a fan of indicators or the chat rooms. Please don’t misunderstand me, I am not saying indicators are not effective and that they are not a viable way to trade, as I am sure there are many traders who do well, but I am not one of them. I see the chat-trading room as a social gathering and not the best environment for learning the business. When I embarked on my trading career, the trading room was where I headed. Nothing positive came from my attendance other than realizing that I should not be there. I wrote about trading rooms in my book, and I only mention them here because my sentiment has changed slightly. I am absolutely not a convert, but for the purpose of trading insight, I have an idea that I will discuss briefly later in this article. Trading requires focus, determination and the ability to follow rules. We have all heard this before, and it is a true statement. But, it is very difficult to come home from a long and stressful day at work and then spend the evenings studying. This may be why many traders choose to trade with indicators, as they are very visual. When the MA crosses the 0 line, or when the 5 period EMA crosses the 3 period EMA, this signals an entry. Unfortunately, it is just not that easy. When a trader visits a webinar sponsored by a vendor, and he hears that a trade can be taken at a certain area because that is where the smart money is, that is confusing to me. I really never got a handle on “smart money” and really don’t see how this helps at all. But, that is me, others may see something different. Also, I really don’t understand the need to study market internals or all of the other information that only bogs down trading focus. Handling a tough market. What does that mean? I am constantly bombarded with emails from vendors, a few who offer a suite of indicators that will make me profitable. I am encouraged to attend their webinar and then I can begin my profitability in three days. I have heard numerous times from many sources, as well as from traders, that no one should be trading on FOMC days due to the fact that this day in particular is a very difficult day to trade. I see the market being tradable every day it is open, no exceptions. I have said and written over and over that I believe people are creatures of habit. These habits and traits carry over into trading. If one studied a chart long enough, and knew what to look for, there would be a good possibility that these “trading habits” would be evident. One way to look at it is to recognize that the market goes up and down. Traders buy and sell. Not trading on FOMC days is a choice, a choice made not because the market is different, it is a choice made because the trader perceives the market as being different. In some respects, this is understandable. If, through your years of trading and training, it was burned into your brain that you should not trade FOMC days because it is dangerous, then you will have this fear and bias, and you will not be able to. This certainly does not mean FOMC days can’t be traded, as they certainly can be. If you are a full time trader and you do this for a living, you should take the time to learn to overcome this bias. After all, FOMC days, as well as other NEWS days are not holidays and therefore should be traded, as there are profit opportunities. Why take a day off and not take advantage of potential income. But, as I mentioned, some traders have this fear and bias. I am sure they would very much like to be part of these types of trading days. Possibly the trader is not confident trading with their current method. Actually, it may difficult for many to trade what they may consider a “normal” market. There are no secrets that will assist you in trading successfully. As I see it, all that you need to know is on the chart. All the information regarding news, fundamentals, etc. is shown right there. I could go on and on about just how much market information that you don’t need to know, such as divergences, histograms, market delta, market profile, etc. Again, I am not saying that all of this does not work and is not viable, I am sure it is for some, but in reality if all this was understood by most traders, they would be doing much better. If the goal is profit, then your approach may need to be modified. My view is different, it does not matter to me what the news is, or what did happen or what is going to happen. It only matters what price does and where it goes during and after the news event. This information is displayed right on the chart. If you are unable to “pull the trigger”, or stay in a trade, or if you have too much info to digest before you enter a trade, or if you just don’t have the energy or time that you think may be required in order to be successful, it just may be time to look for alternatives. One alternative to consider is automated trading, a trading technique that I have discussed and written about many times. Our EminiScalp autotrade methods can give traders the confidence to trade the markets every day they are open. This article will highlight our EminiScalp STALKER autotrade method. Over an extensive period of time, and after putting my ideas to the test on a variety of charts and markets, I wrote down what I wanted my strategy to do. The next step was to be able to display this information on the chart. Since I know zilch about writing strategies, as I am aware of my limitations, I contacted one of the best coders available, Tyler Moore of Mooretech LLC. I gave Tyler all of information that I compiled, along with a set of very specific rules and conditions. Just a few words about Tyler. Tyler is a Ninjascript consultant who is a master at coding. Turning ideas into something tangible is what he is does. He is fair, competent and patient, and a master of strategy building. See what he is all about at www.mooretechllc.com. In any case, Tyler turned my thoughts and theories into an effective and practical reality. Since we are talking about automated strategies and FOMC days, let’s take a look at the most recent FOMC day, a day that many are encouraged not to trade. 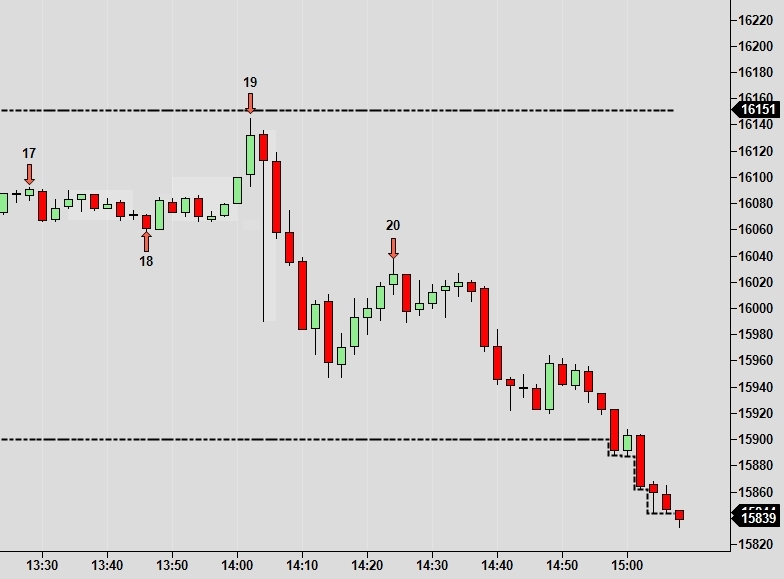 The following are YM charts. The three charts cover just about all of the trading day of Wednesday January 27, 2016. The above chart shows the time period from about 7:30 AM east until about 10:50 AM east or so. The arrows represent EminiScalp STALKER entry areas. Depending upon your stop and target settings, every one of these areas could have been profitable. The dashed black lines show the current high and low of the day. Let’s take a look at the next chart. We pick up on arrow #8, where we left off from the previous chart, and move right up to about 2 PM east to arrow 18. Looks as though we may have an issue at arrow 13. Oh well, nothing is perfect. The entries following #13 don’t look to bad. On to the later part of the day. The previous chart ends with arrow 18, so we can begin here at arrow 19. It may be very difficult, even if you were able to determine the entry area, to manually take the trade at 19, due to a couple of factors. The speed of the set up as well as the fear of trading at this time of day. The EminiScalp STALKER did a fine job. And you know the best part? The trader does not have to do anything other than enable the strategy and set his or her trade management. I would never advocate that a trader enable any strategy and walk away, although with the STALKER, theoretically, this can be done. This could have turned out to be a very profitable day trading the YM. To be candid, other markets looked pretty darned good as well. The objective to all of this is to have a strategy that works along with reasonable expectations in regard to targets. If the information is not already on our site, it will be very soon, but briefly let me explain how the strategy functions during the trading day. Firstly, it is my suggestion that reasonable targets and either hard or trailing stops be set. This can assist a trader in taking profits, and if there is a stop, the trader still has the ability to continue trading. Secondly, once the STALKER enters a trade, no other entries will be executed by the STALKER until the current trade completes, although, entry arrows will still appear. This is how the STALKER is designed. So, hypothetically speaking , and in regard to arrow 13, if an entry occurred at arrow 12 and the trader had set up his or her management with a trailing stop, it is certainly possible that there may not have been a stop at arrow 13. Hmmm. To me, profit is profit, whether it is a little or a lot. Many day traders have a very difficult time entering a trade as they may not be certain if the entry area is correct. Secondly, once in a trade, many traders can’t wait to get out. These are good enough reasons to consider an automated strategy. Why did I show the YM? At $5 a tick, a reasonable stop can be set, as well as realistic targets. But, this is not to say our STALKER is limited. Look below. Above is a 6E chart showing pretty much the whole day, on a higher time frame, the same day as the previous YM charts, 1-27-2016. Yes, the STALKER does a fine job on a variety of different time frames and markets as well as what some may call regular or normal trading days. In the above chart, please notice the arrows identified with A and B. It looks as though the B entry might have been stopped. But, this depends, as I mentioned previously, on the management settings. The STALKER finds a nice entry at A, and depending upon the stop setting, target price or if the management is designed to trail, B could be of no consequence. The STALKER has the ability to turn itself off and on automatically throughout the trading day. Don’t feel comfortable trading the 10 AM east news? Set your parameters and it will disable at say 9:55 and come back on at 10:05 or anytime in between. The STALKER may not capture all the price moves, but it will do what it supposed to do as per its settings. Also, please be advised that yes, the STALKER may be stopped on occasion, as this certainly does happen. The EminiScalp goal is to create a method where there are never any stops. For us, this is a never ending aspiration. For the time being though, I believe we have created automated strategies that have the ability to put the odds in favor of the trader. I personally believe the both the ABL and the STALKER trade better than most traders. Stalkers have no emotions or remorse. Our EminiScalp STALKER enters a trade without emotion and it does so without remorse. As I have mentioned repeatedly, discipline is key. Set up your method, set your management and let them do what they are supposed to. No need to do all this pre market analysis, no need to think that trading “is a battle”, as I hear many describe the profession. The battle, the tough market, the tough trading day, is all about the trader and the emotions, nothing to do with the market. Lighten the load, reduce the stress, eliminate the overload and take a serious look at our EminiScalp autotrade methods. So, there you have it, our EminiScalp STALKER, which “stalks” the price, looking for entry opportunities within the extreme areas. Whether it is a trend day, a range day, a flat day, or any combination thereof, we have the whole day covered. Now, you may ask, “what was the deal with me talking about chat rooms earlier in this article”? As mentioned, I am not a fan of the “room”. But, I have given this quite a bit of thought. I am not certain, as of this writing, if the EminiScalp STALKER I will be available to traders, at least in the very near future. What I am contemplating is presenting a webinar demonstrating in real time, the STALKER, in action. Then, have a room available for interested traders to attend, where they have the ability to take an extended look at the EminiScalp STALKER. This will enable me to explain, in more detail, the possible management techniques that may make the STALKER a viable alternative to the stressful methods many are wrestling with currently. Although I do not care for the trading room, by design, the one that I may propose, will be informative and exciting. Interest will determine the next step.